It takes a lot to garner the attention of the general public at New York Comic-Con, especially if the product being pushed is a brand new comic book franchise. 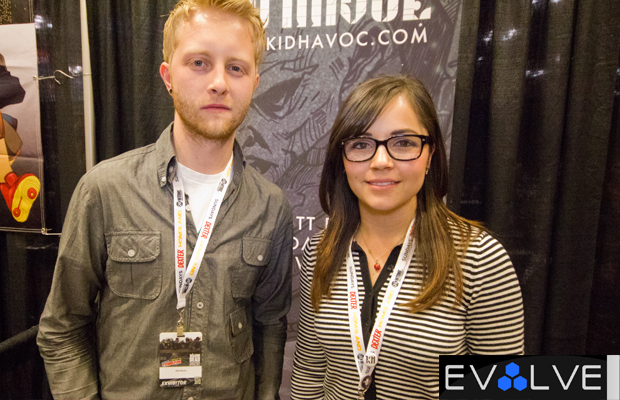 Up-and-coming illustrator Eric Pfeiffer welcomed the challenge and rented a booth during the four-day festivities to show off his newest creation—Kid Havoc. So what makes KC such a dope project? It not only serves as a comic series, but also a clothing line. Pfeiffer teamed up with freelance designer Fern Chavez to create apparel inspired by Kid Havoc story elements, which offers readers insight on what will happen next in the comic’s storyline. Pretty creative. Impressed most by the detailing and dedication, EvolveTV stopped by the booth to get the full logistics on the project. Take a look. And if you’re feeling the work, place your pledge over at the Kid Havoc Kickstarter page.